Alejandro Olmedo's opera career began with the opportunity to sing live for Placido Domingo in 1987. He dedicated a popular Mexican song in honor of Mr. Domingo, who was impressed with the beauty and quality of his voice and encouraged Alejandro to study and train seriously for a career in opera. Following Mr. Domingo's advice, he began studying voice with Fransisco Cassanova and Gustavo Marquez. In 1995, he was a semi-finalist in Operalia in Mexico City and a finalist at the 1997 Operalia contest in Tokyo. Mr. Domingo then introduced Mr. Olemedo to Bruno Pola, the internationally acclaimed Italian baritone. Mr. Pola became Alejandro's teacher and mentor. Mr. Olemedo also coached in operatic repertoire with Jeffrey Goldberg (Metropolitan Opera), James Besser, Aldo di Tullio, and Metropolitan Opera conductor Richard Woitach. Alejandro traveled to Italy, Switzerland, Germany, Sweden and Finland for five consecutive summers to continue his vocal studies with Mr. Pola. In 1998, at the invitation of Mr. Placido Domingo, Alejandro sang for King Juan Carlos of Spain, and his wife, Sophia, Queen of Spain. His current vocal coaches in New York are Metropolitan Opera Assistant Conductor Lucy Arner and Luigi Veccia. Perched for an international career, his performances in leading roles with opera companies in the United States, Mexico and Europe, have won him wide acclaim. 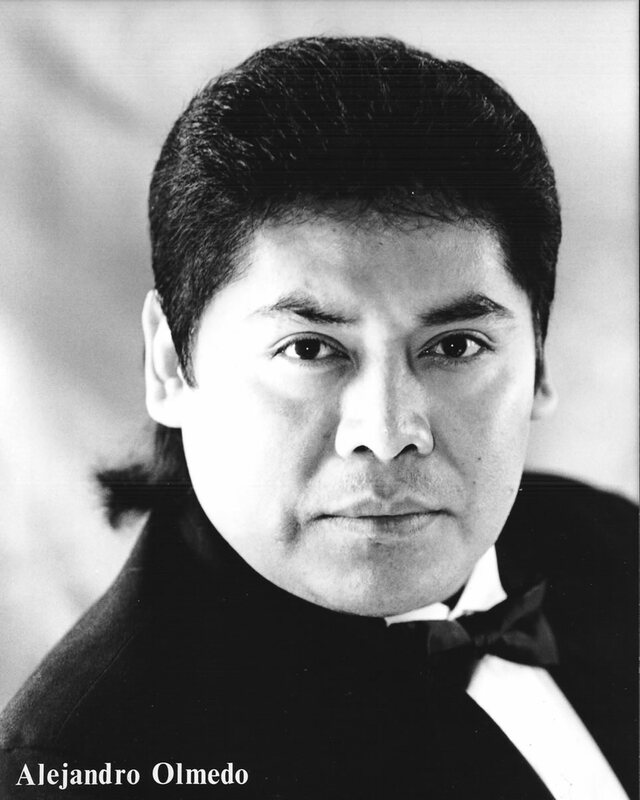 Mr. Olemedo's operatic repertoire includes Otello, Cavalleria Rusticana, Aida, Pagliacci Carmen,Tosca, Il Trovatore, Madame Butterfly, La Traviata, and Rigoletto. In addition to leading roles in productions by Center Stage Opera, based in New Cumberland, PA, Mr. Olmedo was featured in May, 2007, with The Four Tenors in celebration of the 125th birthday of the the country's oldest classical music organization, the Wednesday Club of Harrisburg, PA. He will open the organization's prestigious Forum Concert Series on Sunday, September 16, at 4:00 P.M. at the Forum in Harrisburg. Other Mr. Central PA appearances include a [Norma Swain and Friends] concert at the Historic Peace Church in Camp Hill, PA on August 5. 2007.